I don’t know about you, but I am ready to work on decluttering my home, life and my mind. I need to get things simplified so I can focus on all the new goals and dreams I have for 2017. Before I can really get a handle on my new goals I need to remove as many distractions and clutter that has accumulated over the past year. When we let go of all the unimportant things, it gives you a fresh start and a clean slate to start off 2017. I’m posting this a little late, well a lot latter than I wanted to post this. Due to illnesses that have taken center stage over the past few weeks. I plan on starting my Declutter Challenge in the smallest place in our homes for our First Declutter Challenge. 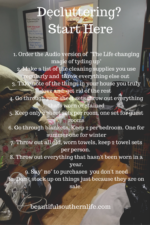 I will share more about the First Challenge tomorrow, but first I would like to share with you how I plan on Doing the Declutter Challenge with you. 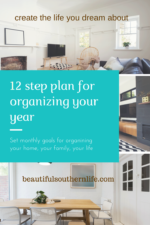 I plan on having the Declutter Challenge posted on the First Wednesday of the month so you will have almost the entire month to work on the Declutter Challenge for that month. I will be working right along with you and will share how I’m doing on Beautiful Southern Life Facebook page. Make sure you follow along with me on the Facebook page and see my before and after photos, how I organized the space, and the products I used to organize the space. I will also post a blog post every Wednesday of everything I’m doing that week, along with photos of products I tried and links to purchase the items I chose to use . Follow along in this series of blog post to help you declutter your home. Ok, Here is how I will be doing the challenge. I will take one room at a time, go through every cabinet, every drawer, every closet and get rid of things we no longer use or want to have around taking up valuable space. I will post before and after pictures of the room or project that I am working on for that week. I will share with you great organizational finds I come across and ideas I dream up to work in the space that i’m working on at the time. I am setting this Challenge up so that you can jump in at any time and start on the Challenge with me. Hey, I didn’t even start on the Challenge until the end of March! This is what I want you to do, close your eyes for a few minutes. Envision what your dream room looks like. Think about how you want the cabinets to look in your room, what type of organization is in your dream room? Now, think about how you can transform your rooms you have now into your dream rooms. If you are like me you love Pinterest and use it to find all those great projects you want to try.Be sure to follow me on Pinterest (follow me Here) and follow my organizational boards so you can get great ideas on what I will be using in my house. In your Pinterest account set up boards for bathroom organization, kitchen organization, bedroom organization, and living room organization, then start pinning all those organizational pins you would like to try. Ok! Now let’s get started. Be sure to subscribe to our email list so you can follow along with us on this challenge. I would love to see how you are doing, post your photos and comments in the comments section below. I look forward to hearing from you. 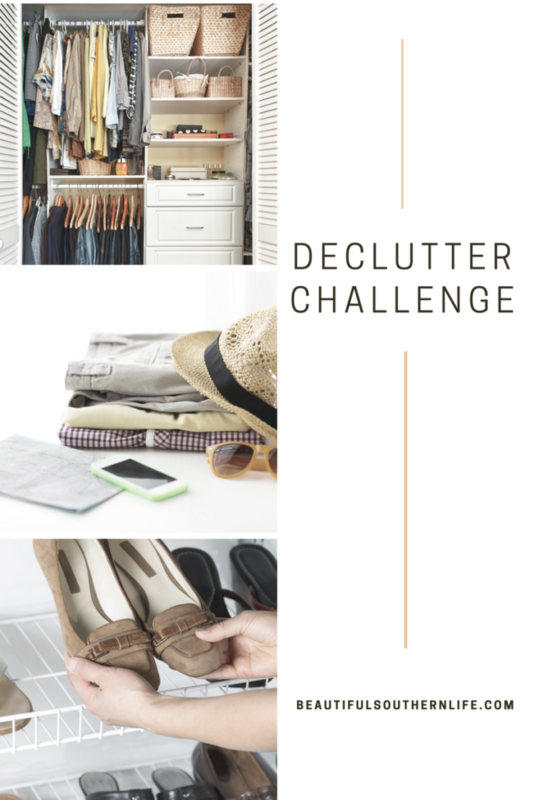 Don’t forget to check back tomorrow for our first declutter challenge!